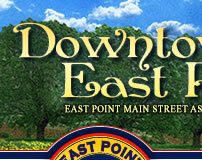 Even prior to the 1887 charter of East Point, the block bounded by Main Street, Cleveland Avenue, East Point Street, and Ware Avenue has been characterized by hospitality. 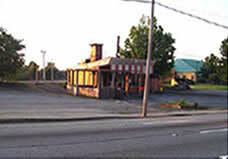 Located approximately where the East Point Library sits now, 2747 Main Street , Nancy Ware ran a boarding house from the 1870s until her death at the age of 79 in 1898. 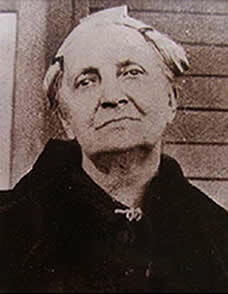 She was hailed as “the mother of the town” by Mr. S.N. Thompson in his “Early History of East Point: An Historical Sketch of Pioneer Days” (written in 1933). Mrs. Ware was the widow of Mr. A.G. Ware, an agent of the Macon & Western Railroad, who died at the age of 47 in 1863. He, as well as Nancy and their son and grandsons, are buried in Oakland Cemetery. At the time of Mr. Ware’s death, the family resided on Mitchell Street in Atlanta. 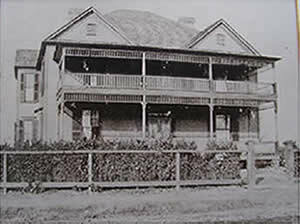 Nancy’s boarding house in East Point was a large, 10-room dwelling. According to the Atlanta Daily Herald dated October 11, 1873, a “dancing party [was] given at the residence of Mrs. A.G. Ware at East Point Thursday night.” At the East Point Historical Society, you can see the original records of Mrs. Ware’s account at E.G. Little’s Grocery. A.G. and Nancy had one child, John Thomas Ware. Capt. J.T. Ware worked for the railroad, and his wife, Pinny, also ran a boarding house in East Point, just around the corner from Nancy. 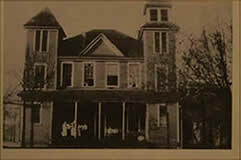 Their home stood on the property that now hosts a barbecue restaurant, the Shack on Main (2714 East Point Street). J.T. and Pinny raised three sons in East Point – Garrett Huls Ware, Howell Horne Ware, and Arthur G. Ware. They each followed in their grandfather’s footsteps – Garrett as a clerk for the Railway Mail Service, and Howell and Arthur as clerks for Western Union Telephone & Cable Company. In his later years, Capt. Ware became known for the chickens and ducks he raised on his property at the corner of Ware Avenue and Cheney Street. He also founded the Cold Springs Cue Grounds, which were located on the property that eventually became the site of the East Point Municipal Swimming Pool and presently the East Point Historical Society (1685 Norman Berry Drive). -Marguerite Murray, EPHS Avenue). 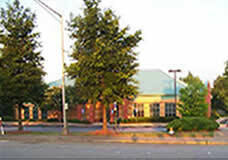 Be sure to visit the East Point Historical Society at 1685 Norman Berry Drive to learn more about our city’s history.